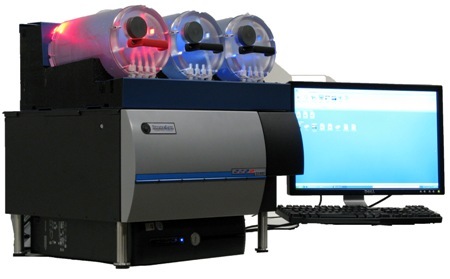 The Stratedigm S1000 flow cytometry platform is a complete cellular analysis system consisting of a flow cytometer with up to 4 lasers, the CellCapTure acquisition and analysis software, and workstation. It employs rugged, modular design architecture for maximum versatility and high-performance typically found in high-end systems, but in a small, light-weight, bench top package. The Stratedigm S1000 is a future-proof investment—its integrated and modular-design ensures that the architecture is functionally open-ended and that upgrading is economically attractive. Given the diversity of applications, dyes, and labels available today, and the promise of even more tomorrow, the ability to customize your cytometer to your research needs is essential in today’s cost-constrained environment.